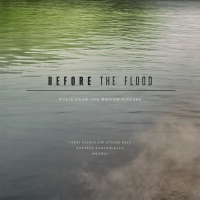 Before The Flood is a 2016 documentary film about climate change directed by Fisher Stevens. Trent Reznor and Atticus Ross were the film's music supervisors. The soundtrack is a collaboration between Reznor, Ross, Mogwai, and Gustavo Santaolalla. Its release number is Null 04, in keeping with The Null Corporation's numbering system. The song "A Minute To Breathe" was released as a digital single on October 7, 2016. The soundtrack was originally made available as an Apple Music exclusive on October 21, 2016 and received a wide digital release on October 28, 2016. A vinyl release was made available on April 21, 2017. A limited number of copies were signed by Trent Reznor, Atticus Ross and Gustavo Santaolalla with 100% of the proceeds of the sales going to TERRAPASS.COM. The signed copies were made available on the Lakeshore Records website along with several record stores across the United States in correlation with both Earth Day and Record Store Day. This page was last modified on 20 September 2017, at 23:03. This page has been accessed 33,698 times.